Lucky13 wrote: You can go with a setup like this. I have them six high, because I like the space on top and the bottom. But you can have them easily 12 high. Or even 18 high if you go all the way to the floor. Are those their 2x6 cases side by side? Is that a MK3 VR6 GTI surf green poster above the speed racer poster? Yes. These are 6 cases that have been mounted side by side. This is what I love about them. You can start with just two and then add more as you need it, but every time it just looks like one case that just grows. That wall started with four cases and now it has seven. There are five more on my other wall and four more across. Hi I build some qty for the garage display case . - Unit Price USD 180.00 / Price includes shipping from Hong Kong to USA and Canada by airmail with tracking no. For other country , please contact me for the update shipping. Please contact us if you like this garage send to your home ! Lets storage your dream models in the nice garage !! - Unit Price USD 120.00 /Price includes shipping from Hong Kong to USA and Canada by airmail with tracking no. Please contact us if you like this garage send to your home! 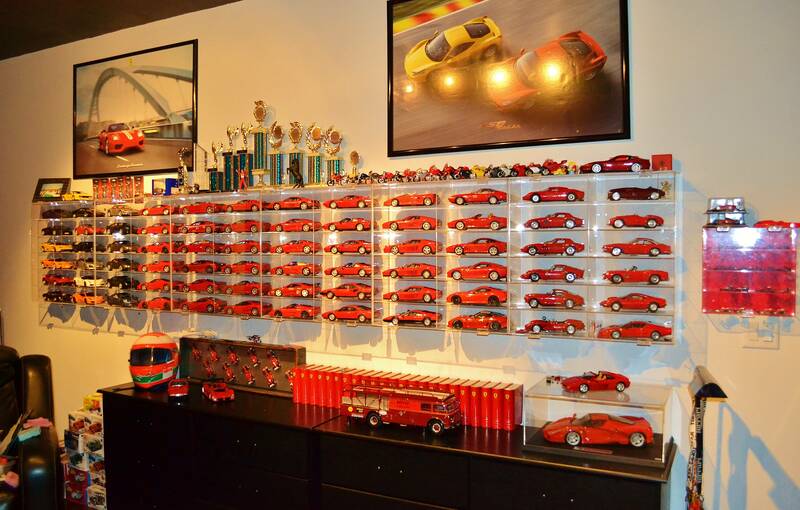 Lets storage your dream models in the nice garage! I believe they are $115 for a case for 12 cars. You can chose with or without dividers. I originally chose to go with dividers, because I was affraid not to have the shelves sag in the middle. However, I have four of them on my other wall, that I went without dividers and they are holding very good for about four years already. The cool thing about going without dividers is, that when displaying alder F1 cars, like my 500F2s for example, you can actually fit three per shelf. This was the reason I went with no dividers. You can also chose clear back or mirrored. I don't remember, but I think the price stayed the same with or without dividers and with or without the mirrored back. I know the topic is old, but I am very curious on how @Lucky13 did his cabinet?